Freedom Mortgage Corp. lost separate bids to escape two putative class actions over allegedly unsolicited phone calls when a New Jersey federal judge ruled Thursday that the customers’ lawsuits supported their claims under the Telephone Consumer Protection Act. 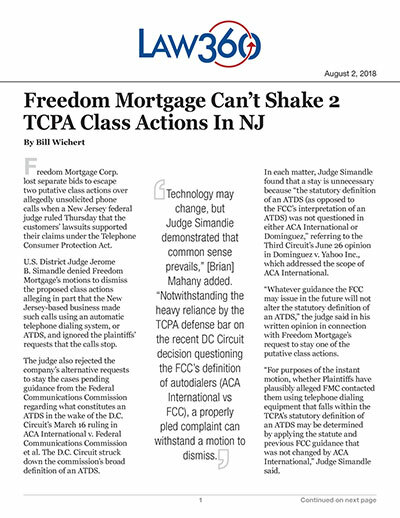 U.S. District Judge Jerome B. Simandle denied Freedom Mortgage’s motions to dismiss the proposed class actions alleging in part that the New Jersey-based business made such calls using an automatic telephone dialing system, or ATDS, and ignored the plaintiffs’ requests that the calls stop. The judge also rejected the company’s alternative requests to stay the cases pending guidance from the Federal Communications Commission regarding what constitutes an ATDS in the wake of the D.C. Circuit’s March 16 ruling in ACA International v. Federal Communications Commission et al. The D.C. Circuit struck down the commission’s broad definition of an ATDS. In each matter, Judge Simandle found that a stay is unnecessary because “the statutory definition of an ATDS (as opposed to the FCC’s interpretation of an ATDS) was not questioned in either ACA International or Dominguez,” referring to the Third Circuit’s June 26 opinion in Dominguez v. Yahoo Inc., which addressed the scope of ACA International. “Whatever guidance the FCC may issue in the future will not alter the statutory definition of an ATDS,” the judge said in his written opinion in connection with Freedom Mortgage’s request to stay one of the putative class actions. “For purposes of the instant motion, whether Plaintiff have plausibly alleged FMC contacted them using telephone dialing equipment that falls within the TCPA’s statutory definition of an ATDS may be determined by applying the statute and previous FCC guidance that was not changed by ACA International,” Judge Simandle said. The judge issued similar findings with respect to Freedom Mortgage’s request to stay the other proposed class action. One of the lawsuits was filed last August by Pennsylvania residents Joshua Somogyi and Kelly Whyle. Somogyi, who obtained a mortgage from the company in 2012, according to the judge’s opinion in that matter. They have alleged that Freedom Mortgage later made unsolicited telemarketing calls to their residence and Joshua Somogyi’s cellphone, the opinion said. “A calling system is no less random if the machine’s universe is the hundreds of thousands of customers, or the residents of a state, or the residents of a nation. Otherwise, the logic of Defendant’s position would lead to the conclusion that a system containing fewer than all the telephones in the world is a preselected, limited universe, and therefore not ‘random.’ Congress could not intend such an absurd result,” Judge Simandle said. The second proposed class action was filed in December by Minnesota resident Stewart Sieleman, who said he began receiving calls to his cellphone from Freedom Mortgage after his mortgage was transferred to the company in 2015, according to the judge’s opinion in his case. The calls urged him to refinance his mortgage with the business, the opinion said. Freedom Mortgage argued that no such consent was needed, because that requirement “‘does not apply to calls that are placed to a number which the called party provided in connection with an existing debt,’” according to the judge’s opinion. Even assuming that Sieleman had provided his cellphone number on his loan application years beforehand, “this Court is unpersuaded by FMC’s argument because calls from a mortgage lender offering refinancing services are not made ‘in connection with an existing debt,’” Judge Simandle said. “The TCPA defense bar tried to delay the case in the hopes of future FCC guidance. As the court noted, future FCC guidance ‘will not alter the statutory definition of ATDS [autodialers]’. Consumers are fed up with these calls. There is no reason to wait another year in the hopes that the FCC will better define what an autodialer is and isn’t,” Mahany said. Counsel for Sieleman and Freedom Mortgage could not immediately be reached for comment Thursday. The Somogyis are represented by Eric Lechtzin, Arthur Stock and Lawrence J. Lederer of Berger & Montague PC and Brian H. Mahany and Timothy J. Granitz of Mahany Law. Sieleman is represented by Arthur Stock of Berger & Montague PC and Stefan Louis Coleman of The Law Offices of Stefan Coleman LLC. Freedom Mortgage is represented in the Somogyi matter by Meredith C. Slawe and Michael W. McTigue Jr. of Akin Gump Strauss Hauer & Feld LLP and Katie Bailey Garayoa of Drinker Biddle & Reath LLP. Freedom Mortgage is represented in the Sieleman matter by David G. Murphy and Travis A. Sabalewski of Reed Smith LLP. The cases are Joshua Somogyi and Kelly Whyle Somogyi v. Freedom Mortgage Corp. and Stewart Sieleman v. Freedom Mortgage Corp., case numbers 1:17cv06546 and 1:17cv13110, in the U.S. District Court for the District of New Jersey.